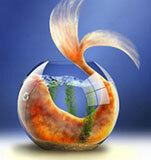 Koi fish are among the hardiest of fresh water fish. These fish are bought and sold around the world and bred for their remarkable colors. Some even sell for thousands of dollars. Although hardy, Koi can at times be weekend by parasites or bacteria. The problem is that there are many of strains of bacteria (Aeromonas and pseudomonas) that can affect these fish. Some fish have resistance to certain strains of these bacteria while others are severely affected by the same. Parasites can also weaken the fish and cause disease. Proper diagnosis is the most important step for the cure.